Massive savings on our print, digital, and bundle subscriptions. This Christmas we're warming things up with our hottest ever subscription deals. Get the glossy print edition of Guitarist delivered straight to your door every month with zero effort for only £48, saving up to 36% on the price you'd pay at the shops. Or you can opt for Guitarist's digital edition - available on your iPad, iPhone, or Android device. Available instantly every month, you can save up to 31% and pay only £27 for a whole year's worth of issues. 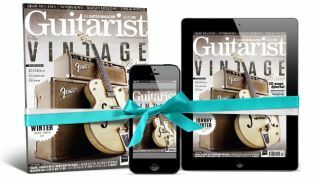 Save up to 51% on a Guitarist subscription this Christmas! Or you can get the best of both worlds and subscribe to our complete print + digital package. Get the printed magazine delivered to your doormat every month AND get instant access on your iOS or Android device for when you're on the move. This amazing bundle starts at £56 with an incredible 51% off the price it would cost to purchase both editions separately. Everything you need is right here. Start reading today.